Earls Court in London plays host to Britain’s biggest beer festival every year in August. Organised by the Campaign for Real Ale (CAMRA), the festival is home to over 700 real ales and foreign beers from around the world. Many beer festivals are held across Britain throughout the year but the CAMRA organised festival is one of the most popular. CAMRA launched their first festival in 1975 in London’s Covent Garden. The venues and cities have changed since 1975 and Earls Court has been the festival location since 2006. Over 65,000 people attend the British Beer Festival each year, and the Earls Court venue itself is styled as one big pub. Festival attendees can sample British ales and drinks from around the world during the five day festival. Brits definitely love their beer and there are over 450 beers on offer throughout the Great British Beer festival. But the festival is not just about British beer. There are also around 200 different beers available from countries such as USA, Belgium and Germany. Don’t fancy beer? Then ciders and wines are available during the festival. This festival definitely appeals to beer lovers and over 350,000 pints of beer were consumed by the festival attendees in 2006. The Great British Beer festival begins with announcement of the prize winning beers. There are eight different beers and ale categories and the winners are decided by the Society of Independent Brewers (SIBA). All of the beers can of course be sampled by attendees to see if they agree with the judge’s decision. Attendees can sample the beers in pint, half pint and third pint glasses. Glasses are purchased by attendees and can then be kept as a festival souvenir or returned and refunded at the end of the day. The National Winter Ales Festival (NWAF) is the sister beer festival to the Great British Beer Festival. This festival is also organised by CAMRA and has been running in various venues across Britain since 1997. The NWAF is held in January each year and is designed as a showcase for Britain’s best winter ales. This festival holds the Champion Winter Beer of Britain awards, and over 200 British and foreign beers are available. The National Winter Ales Festival has been held in a Manchester venue every January since 2005. Tickets to the Great British Beer festival do not include the price of drinks. 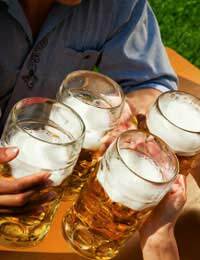 Drinks are reasonably priced and purchasing a third of a pint will usually cost just under one pound. Children can attend the festival if accompanied by adults and must stay in the designated family room; children are permitted free entry. Festival programmes are available for £1.00 and will provide a map of the festival areas. Food is available throughout the festival from various outlets including Indian curries, much favoured by beer drinkers. The Great British Beer Festival makes a great day out for beer lovers. The festival is an annual event on the beer and ale lovers’ calendar and attracts people to the London venue from around the world. More information on the annual Great British Beer Festival can be found on the festival website or from the Campaign for Real Ale website.